Ramen is an institution in Japan. People will queue for hours outside their favourite ramen-ya in order to slurp on their bowl of delicious ramen. 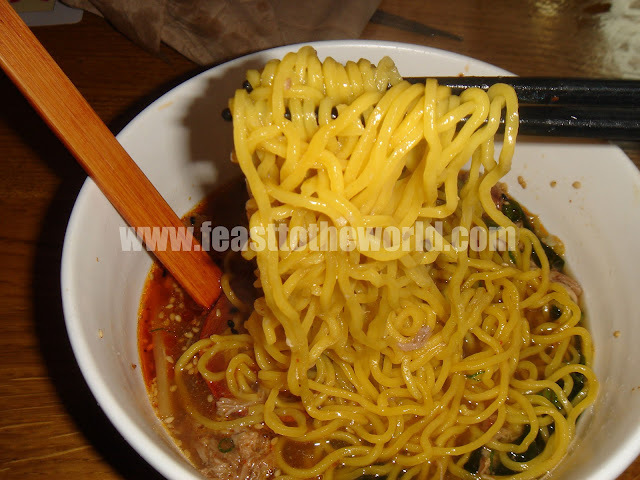 But this dish is often misunderstood by people who are not familiar with Ramen. It is more than just egg noodles served in a bowl of soup. 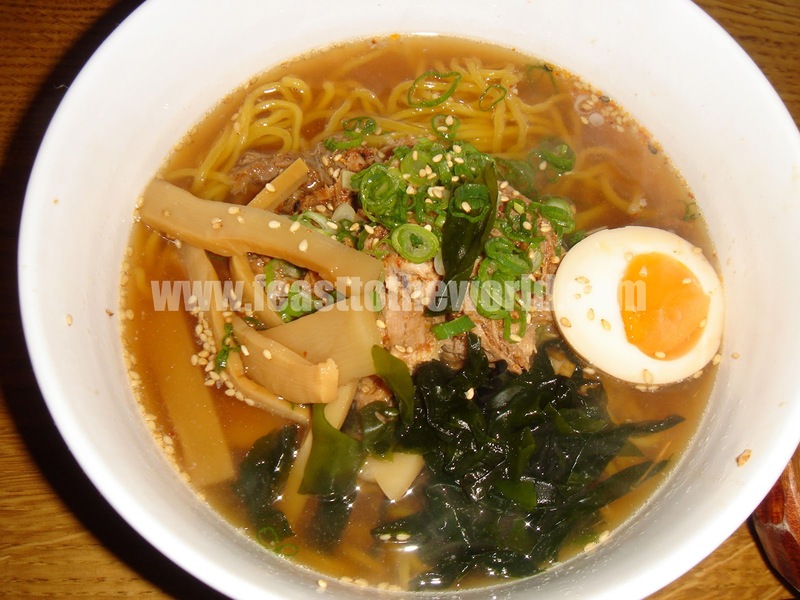 There is a hidden art to this wonderfully rich bowl of umami-laden noodles broth. 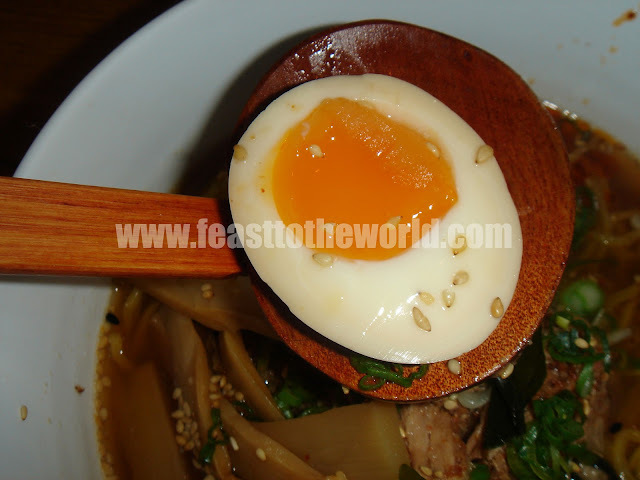 There are generally four main types of broth that accompanied these bouncy egg noodles. Just like the Spanish Paella, different part of Japan has different type of broth that reflect the region. 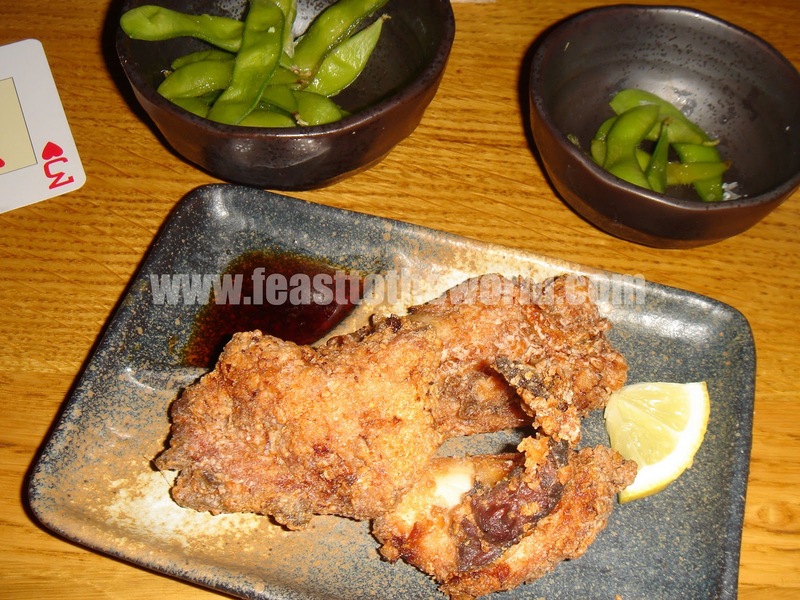 The simplest of these are the Shio (salt) which has a clear, light and salty characteristics. Tonkotsu, the most popular version, has in contrast a thick, rich and cloudy appearance. This is due to the fact it is made by boiling pork bones, trotters, fat and collagen over a long period of time, thereby creating this creamy, kotteri (rich) and strong pork flavoured broth. And because of the richness, thin and straight Kyushu style noodles are normally served with this rather than the curly version. This is so that the noodles carry just the right amount of the thick broth with each slurp. This is definitely a true ramen aficionado's top choice. Shoyu is a soy sauce based clear broth and is the more common variety to be found in Tokyo. Lastly is the Miso, a combination of miso paste and Shoyu broth, which is a more recent inclusion the the ramen family. This originated from Sopporo in Hokkaido. It is sweet, rich and robust and therefore are normally serve with condiment that are strong in flavour such as buttered corn. Being brought up in the noodles slurping nation of Singapore, I am, I must admit, slightly obsessed with ramen. This is not that surprising considering the close relations and bonds between Singapore and Japan. Japanese formed the largest number of tourist and practically everywhere you go, you'll see Japanese influences, in relations to music, fashion and food. The recent Ultimate Ramen Championship held in Singapore is a fine proof of this. Six top Japanese ramen-ya chef were invited to Singapore to have a contest to find the best ramen. Ever since I went to the Tsuru Seafood Ramen event a few weeks ago, I have been looking forward to this next ramen pop-up event. A couple of days prior to this, I found out through twitter that they have finally decided on a name for the up coming ramen restaurant ....Tonkotsu - Bar and Ramen. Fantastic, I thought to myself, this is finally happening. However, there is still a tiny part of me thinking, even though I enjoyed the last ramen, was it just a fluke? Are they a one hit wonder? Will the rest of the ramen be just as good? Arriving at this Tokyo spicy ramen event, my partner M and I were swiftly shown to our table and immediately offered with a bowl of the delectable Edamame beans, perfectly cooked, sweet with still a light crunch to the bite. M, being M, chewed on the whole pod before realising that the pod was not meant to be eaten and quickly spat it back out again. There was a new introduction to the menu, the prawn gyōza. 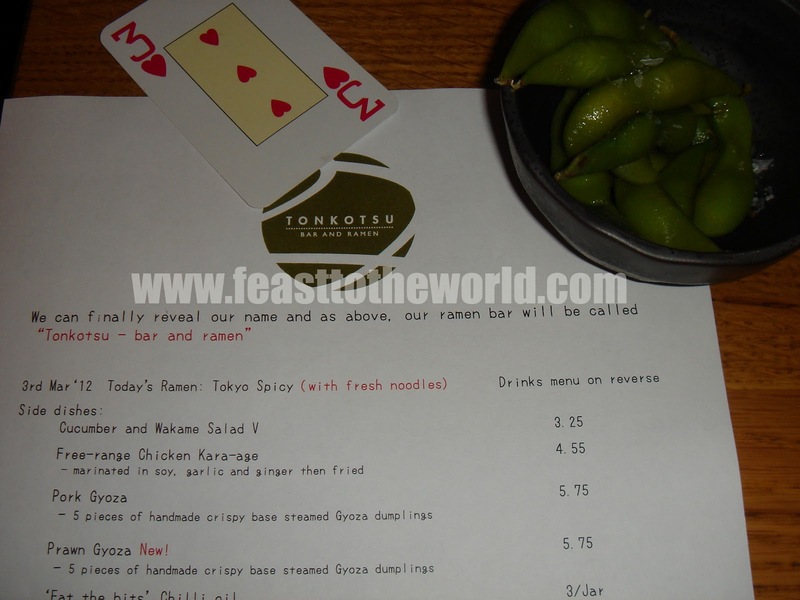 We decided to order that, along with the pork gyōza and chicken kara-age while we waited. The kare-age was absolutely delicious. It arrived piping hot, just how it should be, crispy and well flavoured. Even better than I remember it. The pork and prawn gyōza arrived not long after. It was around this point, a solitary slurping noise can be heard from a satisfied ramen eater in a corner behind me. This is a good sign as this is normally a show of respect to a good bowl of ramen. 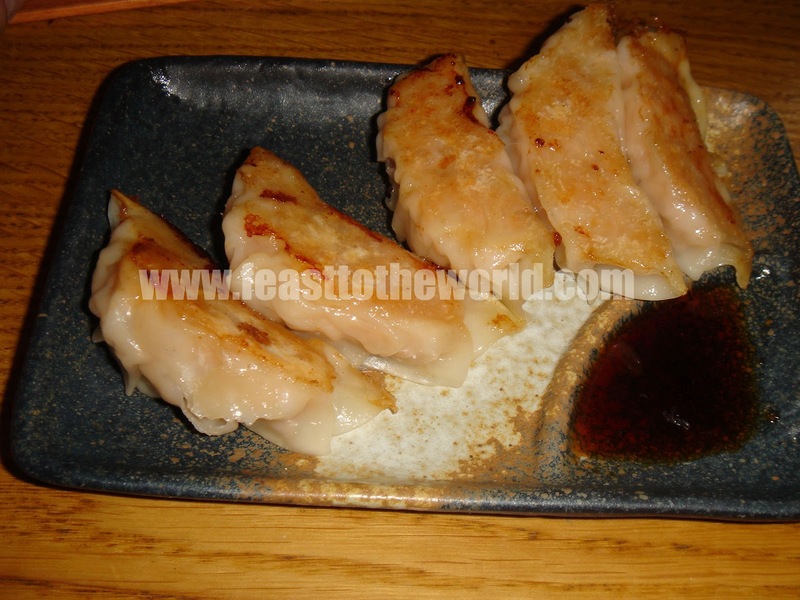 The pork gyōza were as excellent as ever, juicy and sweet, just the way I remember it. A few of the prawn gyōza were a bit too prawny and cold. That said, the rest were hot and fine, a worthy addition to the gyōza repertoire. Next up was the Tokyo Spicy ramen, the one I have been waiting for. It looks sensational, well balanced condiments in a clear, brown broth. There were menma (marinated bamboo shoots), braised pork, spring onions, wakame (seaweed), half-boiled egg (my favourite) and a scattered of toasted sesame seeds. There is hint of nutty fragrance and the aroma is just irresistible. 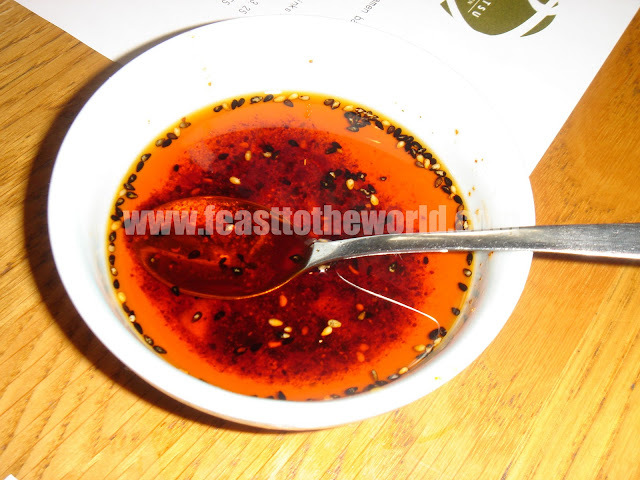 The broth has a certain depth and complexity that can only be achieved by a long cooking process, slightly spicy, flavoursome and yet delicate. It is at this point, I added a spoonful of the chilli sesame oil that was on offered on the side. This was just perfect, it added to the the nuttiness and spicy kick, just the way I like it. The noodles were bouncy with a tender bite, unlike the last ramen I had, had no hint of kansui (alkali) taste at all. The pork has such a velvety texture that it just melt in you mouth and falls apart. And then you get the crunchiness from the menma and wakame. This is it, I thought to myself, a perfect bowl of ramen. All the ingredients amalgamated in harmony and produced an explosion of flavours, attacking every sense. The venue for Tonkotsu - Bar and Ramen is at the moment still undecided, but I sincerely hope that wherever they eventually pick, it is not too far for me to get to because believe me, I will not hesitate to make it my regular haunt to satisfied my ramen fixation.